In 2017 Otago Peninsula Trust, New Zealand’s first private charitable conservation trust, celebrates 50 years of stellar achievements with a lively calendar of events and commemorations. The Trust is a New Zealand ecotourism pioneer which created and manages iconic award winning attractions on Otago Peninsula to fulfil its mission ‘To preserve and enhance Otago Peninsula’. Enterprises include the Royal Albatross Centre, the site of the world’s only mainland Royal Albatross breeding colony; Fort Taiaroa a hidden fort with the world’s only fully restored 1886 Armstrong Disappearing Gun; Glenfalloch Woodland Garden, a historic 30 acre garden saved from subdivision; Fletcher House, a restored Edwardian villa; and a joint venture with a local Maori family – Blue Penguins Pukekura, evening viewing of the world’s smallest penguin. Other activities include guardianship and facilitation roles plus encouraging future conservationists through educational programmes. The Otago Peninsula Trust was formed in 1967 by the Dunedin Jaycee Chapter who wanted to see Dunedin flourish and had identified Otago Peninsula as the major asset for the city. Founding Trustee Bill Dawson explains “It was the mid-1960s and Dunedin was in the doldrums. The Chapter surveyed over 200 leading citizens and discussed ideas for how to reinvigorate the city’s economy. Three main strengths were identified, education, heritage and tourism. Professor Ron Lister pointed out that the Otago Peninsula had many unique attributes with its unique wildlife and coastal scenery; its natural features and historical heritage were also outstanding. This led to Dunedin Jaycees forming the Otago Peninsula Trust with the purpose of protecting and enhancing Otago Peninsula, allowing visitors to enjoy the peninsula wildlife, with a very strong emphasis on conservation. The Trust was unique at the time – New Zealand’s first private charitable conservation trust”. 50 year Trust stalwart Laurie Stewart adds “Dunedin’s economy has been boosted due to the foresight and dedication of the early trust volunteers, with thousands of hours of work, fundraising and projects by various Dunedin Service Clubs. This year we’d like to pay tribute to all the people involved over the 50 years of the Trust and acknowledge the work they’ve done ‘behind the scenes’. We have some great stories to share; Royal visits, A bulldozer in the albatross colony, service clubs competing for ditch digging prizes, 15 years of getting the Armstrong Disappearing Gun back in working order to earn a rare International Heritage Award from the UK Institute of Mechanical Engineers, many trials and tribulations including fires, fundraising fun and major achievements”. As well as creating amenities for residents and visitors the Trust has become a major economic contributor and enabler for Dunedin’s tourism industry. Today Otago Peninsula’s wildlife is estimated to be worth well over $100 million each year to the Dunedin economy. The Trust is a major contributor and employer for the peninsula with over 80 staff employed in peak visitor season. The Trust has a year of events, offers and commemorations planned. CEO of the Otago Peninsula Trust, Robyn McDonald says “2017 is a very special year for the Trust as we celebrate our 50th birthday. We are sharing stories of the people, places and projects which have contributed to Otago Peninsula Trust’s achievements since 1967. We’d like to share with people that attractions and facilities they may take for granted, around the Peninsula, at Glenfalloch and The Royal Albatross Colony, have been championed, fundraised for and maintained by a small group of passionate Dunedin people who’ve worked hard to preserve and enhance Otago Peninsula for everyone to enjoy”. “The stories share interesting items from the Trust’s archives and insights from people who’ve worked on projects over the years. We are so lucky to have two original Board members, Bill Dawson and Laurie Stewart who’ve been part of the Trust’s history for the whole 50 years, and can reveal stories behind the Trust’s projects over that entire period”. Robyn adds “Otago Peninsula Trust’s portfolio has grown considerably since 1967 when it was formed to save Glenfalloch Garden. In 1972 we started offering tours at the Royal Albatross Centre, 1987 Fort Taiaroa was opened and in 2012 we began a joint venture at Blue Penguins Pukekura. We are also responsible for the management of Fletcher House, the Sandymount Lime Kilns, support Colinswood native bush and various grants and projects on the peninsula. We inspire the next generation with our student education programme and the Air New Zealand ‘Kids Restore’ initiative. ‘With the growth of the visitor sector we now host over 200,000 people each year through our visitor attractions. Our successful visitor operations enable us to carry out our objectives and contribute to the peninsula’s long term sustainability, both as a visitor destination and a valuable habitat for rare and iconic wildlife. Growth in our visitor sites and numbers has helped us hugely in our work towards the Trust’s overall objectives to preserve, protect, enhance, develop and promote the entities under its umbrella’. “This year especially we’d like to encourage more people to support us and boost the Trust’s great work, enjoy the unique attractions – which are world class, and help the Trust to strengthen its contribution to Dunedin’s economic and environmental goals’. Robyn states “We are so grateful for all of the volunteer support over the 50 years of the Trust’s existence that makes the Trust’s achievements happen, from the Board of Trustees who freely offer their time and expertise to the Fort Taiaroa education and Resource Committee, the Friends of Glenfalloch Garden and many other people who generously give us their time and resources to care for our unique Otago Peninsula. We are a substantial entity for positive guardianship of the Otago Peninsula”. Today Otago Peninsula Trust offers a wide range of experiences from award winning unique wildlife and heritage tours to catered functions, transportation options and regular events. The attractions rate highly on visitor satisfaction measures: annually the Royal Albatross Centre wins a Trip Advisor Certificate of Excellence, is constantly in the top 10 Dunedin attractions and holds a Qualmark Gold Enviro Mark. The Trust’s partnership with the Department of Conservation has seen the numbers of albatross at the colony growing from a few albatross in the 1930s to over 250 today with an average of 23 chicks successfully fledging each year. 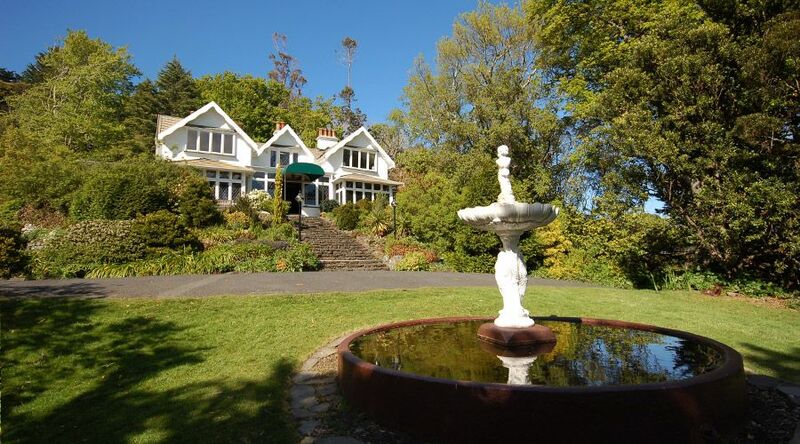 Glenfalloch is a top Dunedin garden, a top ten Dunedin restaurant and hosts thousands of people annually for garden visits, functions and dining. Blue Penguins Pukekura, also a Tripadvisor Certificate of Excellence holder and top 10 Dunedin attraction is a leading example of a successful joint venture with a local iwi with the number of Little Blue breeding pairs grown from 30 in the early 2000s to over 200 and visitor numbers reaching capacity. With a proud 50 year heritage the members of Otago Peninsula Trust have invested millions of dollars and countless hours to create unique ecotourism attractions delivering world class visitor experiences while protecting and enhancing conservation of an outstanding area. Their dream of boosting Dunedin’s economy and showcasing the city’s unique wildlife attractions has certainly come true. Glenfalloch Woodland Garden. Stunning 1871 historic garden. Seasonal displays. Electric Green Bike hire. Glenfalloch Restaurants; Top 10 Dunedin Restaurant. Dining, Weddings, functions and conferences. Education Programmes: Interactive student focussed LEOTC in natural environments. 1966: The idea of Otago Peninsula Trust was developed by Dunedin Jaycees – a group of entrepreneurial businessmen who identified heritage, education and tourism as the city’s key strengths. 1967: 18th July. Otago Peninsula Trust formally incorporated as New Zealand’s first private charitable conservation trust. 1969: 1st February. Glenfalloch Garden acquired after significant fundraising efforts, including Jaycee Mystery Envelope Appeal which raised around $25,000 towards Glenfalloch purchase. Significant work undertaken to upgrade property for functions, weddings, garden viewing and community events. 1972: 23 February After five dedicated years of work and fundraising the Royal Albatross Colony opens for public viewing with observatory opened by Minister of Internal Affairs. 1989: 3 February New Royal Albatross Centre opened by Princess Anne after over $900,000 raised to fund the building, displays and interactive education facilities. 1990: New restaurant and function Chalet opened at Glenfalloch Garden to cater for growing demand for events, weddings and celebrations. 1992: Fletcher House management contract awarded to Trust. Fletcher House restored by The Fletcher Trust – first building built by Sir James Fletcher in 1909 at Broad Bay. 2001: LEOTC Education Programme awarded to Trust enabling thousands of children to access educational opportunities at the Royal Albatross Centre. 2007: 500th Chick “Toroa” hatches. Toroa is a grand-chick of world famous “Grandma”, who lived to 62 years. In 2016 Toroa’s first chick hatched at the Royal Albatross Colony. 2010: 1,000,000 visitor to take a tour at the Royal Albatross Colony. Each year the Centre hosts over 100,000 visitors to Pukekua/Taiaroa Head with most choosing to support the centre’s work by taking a tour, donating or purchasing a meal or gift. 2012: 25 October. Blue Penguins Pukekura at Pilots Beach opens for evening tours. This conservation project is a joint venture between the Otago Peninsula Trust and the Korako Karetai Trust to ensure the Little Blue Penguins and their habitat are protected.